Teaching Without Walls: Life Beyond the Lecture: New TWW Resource: Educator's Guide to Ning - experience the power of participatory learning!! New TWW Resource: Educator's Guide to Ning - experience the power of participatory learning!! I am excited to share the newest Teaching Without Walls resource: An Educator's Guide to Ning. The guide provides a clear, easy-to-follow explanation of how to create a social network in Ning and is enhanced with many tips and creative strategies I've learned through my own teaching experiences with Ning. 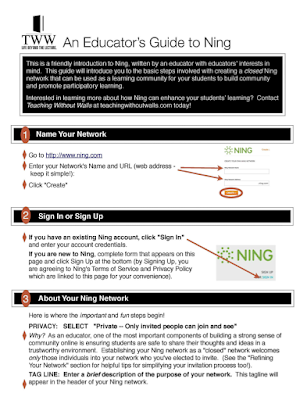 Ning is easy to use but when you're an educator, there are things that need to be considered to foster community and understanding how to harness the controls and settings in your Ning network can really help. I thought long and hard about all the hard lessons I learned with Ning (for example, all those emails from students..."I never got my invitation!") and shared my strategies for overcoming these problems. Experienced Ning users may read the guide and find nothing earth shattering but new users of Ning will save time and increase the community-building potential of Ning from the start! Why use Ning? The MacArthur Foundation has been a vocal advocate of the importance of exploring how participatory learning can and will reshape the future of our learning institutions. Ning is a free social networking tool that provides anyone with the option to create a closed social network (as opposed to an open social network like Facebook or MySpace). If you're committed to innovation in education, think it's important for formal learning to be relevant to students' informal learning patterns, or are looking for a new, more visual environment to enhance your students' Blackboard experience with...try Ning! To download the Educator's Guide to Ning, please visit the Resources page of Teaching Without Walls.